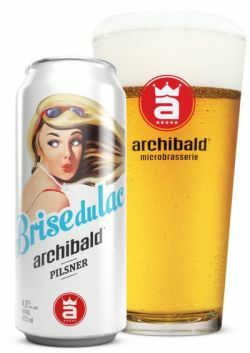 UPDATED: MAR 5, 2019 On tap at Archibald – Montreal Airport, pours a clear dull yellow with a small white head. Aroma brings out cereal grainy notes and toasted malt. Flavour is along the same lines with crisp biscuity malt and grainy notes. A bit seltzer, but it works. UPDATED: DEC 14, 2018 Crisp enough and fits style like Lady Gaga in a meat dress. Pours golden with ok head. Clean end. Some crisp hops. Tap at airport brewpub in YUL. Canette. Le nez apporte des arômes de prune jaunes, assez floral et herbal. En bouche c'est très léger, pas beaucouo de saveur en début de gorgée. Une vague d'intensité modérée de houblons sec et floraux vient ajouter un peu de saveur, juste assez pour apporter plus de corps qu'une Heineken. À considérer comme une introduction aux pils. Can enjoyed from a mason jar at my hotel room in NL. Spirited carbonation gave me trouble pouring. Slightly hazy dark yellow color with a huge bubbly white head. light bready crackery pilsner malt hints of floral hops and a touch of clove that shouldn't be there. from can: thick white foamy head with mild fruit aromas. heavy lacings left on glass. initial taste is metallic with some sugar. very light body that finishes with moderate hop bitterness. pretty boring stuff. Manque de mordant pour une pilsner et je me serais passé du blé malté, mais pas mauvaise pour autant si on prend en compte la pauvre compétition dans cette marge de prix (1.5$ canette 355ml). Bière très jaune qui a une personalité assez complexe malgré tout, avec un sucre présent, de la poire de la banane, du malt en veux tu en voila, une finale sèche laissant des traces de ce houblons qui manque sur la langue faut de l'avoir pleinement en goût. Ni mauvaise no bonne, très buvable par contre! Bright dark straw color with moderate activity. Foamy white 1 finger head, lasting around 5 minutes, with poor legs. Flavors of sweet grains, caramel, corn, faint lemon and noble spices. Very sugary, low bitterness. Slick and smooth full body with extra prickly carbonation. Feels a little adjunct and too syrupy. Light finish that ends with tons of sweetness and faint grassiness. Overall bad quality stuff. Way too accessible. Poorly flavored, too much corn. The freshness is alright. Not much of a pilsener. Light gold color. Foamy head that disappeared quickly. Very clean taste. Tastier than the standard macro products. Good pils. Will drink again. Bière en cannette, 473 ml. Belle robe jaune, le goût début de la gorgée est correct. Se termine par contre avec trop d’amertume à min goût.